The Ragdoll breed of cat was developed by a breeder in California, Ann Baker, in the 1960s. She bred a white female Persian that carried Siamese markings to a male Birman. 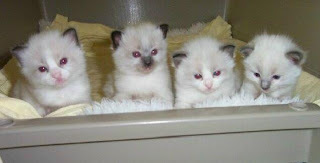 She introduced those offspring to a female Burmese, resulting in today's Ragdoll, a medium sized breed with oval blue eyes and a medium length coat with Siamese markings. Mature Ragdolls (considered adult around age three), are heavier than other breeds; males will weigh anywhere from twelve to twenty pounds and females ten to fifteen pounds. They will live an average of twelve to twenty years. Their fur does not tend to mat or shed excessively, all though regular grooming is a must (something this breed does not mind). A Ragdoll's coat will start all white at birth then develop into four colors: seal, which has dark seal brown points with a light tan body; chocolate, which has milk chocolate points with an ivory body; blue, which has dark gray points with a pale gray body; and, lilac, which has pinkish gray points with a frosty white body. In addition to these colors, Ragdolls have three patterns: colorpoint, which has dark points (ears, tail, face, and feet) with a body of a lighter shade and no white markings; mitted, which has dark points and lighter body, but also has white 'mitts' on the front paws, white 'boots' on the back legs and feet, a white chin, a white strip on the stomach, and a white ruff; and, bi-color, which has the dark points (ears and tail), but the mask is interrupted by a 'V' running between the eyes and expanding into the muzzle. Ragdolls make good family pets for several reasons. They like their human company and try to be 'considerate' of their family. Ragdolls take care not to scratch children and are gentle around them, and will follow their family around the house to be in their company. They are not noisy and talkative, and tend to keep their purring at a low volume. Ragdolls are also intelligent cats and can be trained easily when given rewards. They are described as docile and laid back almost to a fault. Because of this temperament, Ragdolls are less likely to defend themselves in dangerous situations. For this reason, Ragdolls should be kept indoors at all times and away from more dominant animals (whether cat or another family pet). This is a healthy breed of cat and Ragdolls do not have any unusual medical concerns.